Villa Fillinelle is a medieval house elegantly transformed into a lovely Relais in the heart of Chianti. 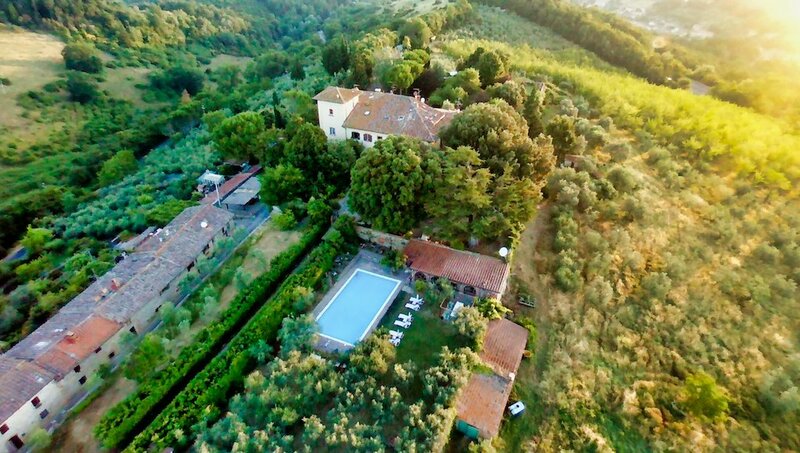 Placed near Florence and Siena, in the middle of the nature and the history, Villa Fillinelle is the perfect place for your holidays in Tuscany. The Villa is full of charm and relaxation: if by its rooms you can see the noble origins of the ancient Florentine families who spent long vacation periods here, today Villa Villanelle offers visitors the unique experience of staying in prestigious Suite, all elegantly furnished and equipped with private bath, fine linens, closets, living room and satellite TV. The rooms are accessed through the Great Festival Hall, now used as Lounge and Dining Room. The kitchen overlooks the salon. It has a pleasant rustic flavor but it is equipped with all modern appliances. A 7000 m park planted with olive trees, secular trees, evergreen and fragrant plants, surrounds the Villa. A swimming pool of 100mq and furnished by free deckchairs, sun beds and umbrellas interrupts it. Near the swimming pool there is the Loft Rondinelli. It has two rooms, a private kitchen, a living room and a private bathroom. At Villa Fillinelle the children are welcome, pets are allowed. At guests disposal: laundry service, private parking and transfer service. Upon request we can cook for you italian traditional dishes and organize art classes, cooking and gardening (purchase services). Villa Fillinelle awaits you as our guests both you choose a B&B ospitality service or you choose it to rent all it for a minimum stay of 7 nights. The Villa is also available for public and private Events, Weddings, Best Tasting and Vacations Business. Villa Fillinelle has successfully passed the 100 Quality Controls established by the "Certification Protocol of Historic Houses of Excellence" and is properly certified by the ITALIAN REGISTRY OF THE HISTORIC HOUSES OF EXCELLENCE. CONDITIONS - Vip Experience is reserved to clients of Residenze d’Epoca with VIP Coupon that will BOOK DIRECTLY at Villa Fillinelle by 31/12/2019 in a superior room (NO base room). Villa Fillinelle can guarantee Vip Experience for up to 2 guests (rooms) during the same period. Vip Experience does NOT include the costs of the stay. CONDIZIONI - The Vip Experience is reserved to Residenze d'Epoca clients in possession of a VIP Coupon, who will directly book a stay in a double superior room (NOT a standard room) at Villa Fillinelle within 31/12/2019. Villa Fillinelle will guarantee the Vip Experience to maximum two clients (rooms) in the same period. The Vip Experience doesn't include the cost of the stay. We have sent you a confirmation. We'll advice you when a "VIP Coupon - Complimentary" will be available (FREE for you, offered by Villa Fillinelle). The phone number of Villa Fillinelle is +39 3356146728.